With more than 200 residents in attendance, Mayor Sandra Armenta made this point clear in her vivid presentation of Rosemead’s State of the City address on Wednesday. The event was hosted by the City of Rosemead and the Rosemead Chamber of Commerce at the Garvey Community Center. The mayor, who has been a teacher since 1997, and most recently with the Garvey School District, provided a pictorial tour of the many recent improvements to Rosemead’s community, while also giving an overview of Rosemead’s 2012-13 Strategic Plan. Armenta explained that Rosemead’s Strategic Plan establishes a vision for 2020 by identifying itself as today’s small town America. To reach this goal, the City of Rosemead must ensure its continued financial viability, according to the mayor. She said the city’s budgeting and spending practices work toward this end by not only promoting transparency but also by upholding certain guiding principles. According to Armenta, such principles include always living within one’s means, employing cost recovery when setting fees for individualized services, and using reserves only for one-time expenditures or temporary stop-gap measures. “These guiding principles provide policy foundation for the development of a balanced budget in the face of the largest deficit in the city’s history,” she said. Armenta went on to discuss public safety, saying that law enforcement continues to be the number one funding priority for the city. She said the budget allocation for public safety includes a 2.23 percent increase in the annual contract cost for the Los Angeles County Sheriff’s Department. Rosemead’s unique public safety model consists of a unified command structure that features the designation of a county sheriff lieutenant as the city’s chief of police. According to Armenta, the success of the Public Safety Department is attributed not only to a continued decrease in the city’s crime rate, but also to its dedicated civilian support staff and code enforcement officers who provide community-oriented policing. The mayor noted that business is also looking good for the city due to the city’s beautification program. She announced to the surprise of the crowd that a T.G.I. Friday’s restaurant and bar is planning to open in Rosemead in November. Other new lease agreements secured by the city include Chipotle Mexican Grill, the Habit Burger Grill, and the Olive Garden Italian Restaurant. Speaking on the city’s continued prosperity and economic growth, Armenta said that these new restaurants and other private sector projects would serve to increase the city’s revenue base. 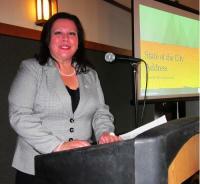 She said such enhancements are possible through the city’s tree planting program that has helped the city to earn the designation of Tree City USA, beautifying landscaped medians and parkways along Rosemead’s streets, and the completion of the first two phases of the Rosemead Civic Center Improvement Project. The improvement project transforms City Hall, the Rosemead Library, and the Rosemead Community Recreation Center into a vibrant hub for connecting the community. The aging parking lot was replaced with concrete, and a block wall that once separated the three facilities was removed and replaced with a pedestrian friendly setting that includes a walkway and safe pedestrian access. Armenta said that Phases 3 and 4 of the Civic Center Improvement Project would continue the overall plan of developing the connectivity for the downtown center, which includes the completion of the plaza between the Rosemead Library and City Hall and the expansion of the Recreation Center. She said that despite the state’s actions to eliminate redevelopment, the city has still managed to position itself well to continue these capital improvement programs. Several of the improvements will occur through the use of competitive grants and special revenue funds designed to improve infrastructure and other community assets. But there’s always a “however,” said Armenta. The extent by which the full slate of CIP improvements can be constructed during the upcoming fiscal year will depend on whether the state will block the city’s ability to use $7 million of its existing redevelopment bond proceeds. Armenta also said that Rosemead wants to get its citizens involved in upgrading the appearance of their own neighborhoods by asking residents to consider removing barbed wire, chain-link fences from front yards, and bars from windows. To help accomplish this, residents may receive free assistance from the Public Works Department by contacting them at (626) 569-2262.